TOUCHED BY AN ANGEL: Fab news - Crafting Musketeers NEW DT position. Hi everyone I hope that you are all well and happy! Welcome to my little but of blogland. Firstly I would like to say many congratulations to THE DUKE AND DUCHESS OF CAMBRIDGE ON THE BIRTH OF THERE BABY GIRL! Also my post today is my very first for the Crafting Musketeers and the theme is Use a Die Cut. have been asked to join such a talented bunch of crafters! So here is a card that I have created for this challenge and I hope that you like it. Using a 5x7 card blank as the base i covered it with some lovely accented heart cardstock from the Sugar buttons kit by Kanban. 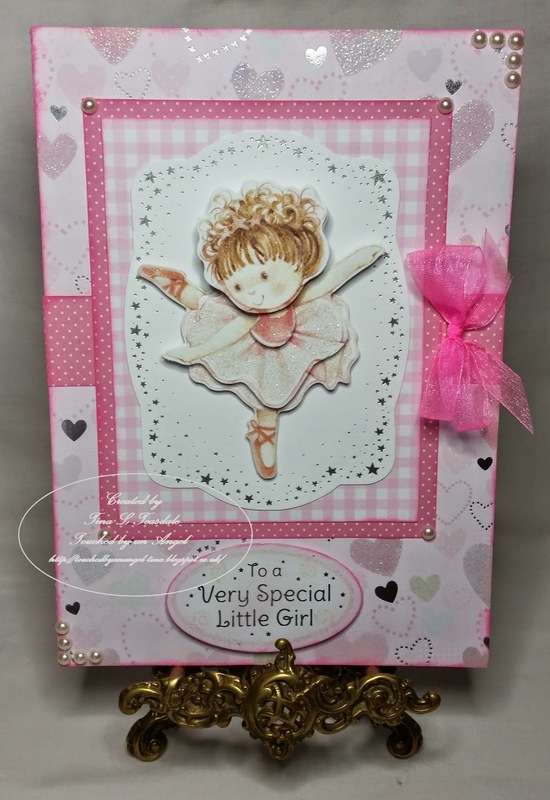 I next created the topper by decoupaging a little ballerina girl and layering her onto some gingham cardstock and dotty paper. Accross the centre of the card I have popped a little of the dotty paper. I have also inked around the edges of all the cardstock and paper. The little sentiment is from the Sugar Buttons kit also and to finish I have embellished with some self adhesive pearls and a double tied pink organza bow. Please do pop along and join in with the challenge for your chance to win the fab prize that is on offer from our sponsors Hobby House and JDG crafts this month. Congratulations. A gorgeous card and love the cute image.